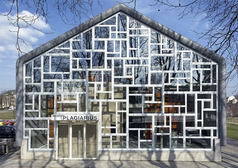 Here you will find some information on Museum Plagiarius. Consider its location and main expositions. The museum was opened in Germany, and it exposes copycats. Museum Plagiarius in Solingen, Germany officially opened its doors to the public, unveiling a parade of 300 original products alongside their knock-off inferiors. The unique collection will show more than 250 originals and plagiarisms of all kinds of industries in direct comparison to visualize the problem and sensitize the public. “Plagiarius” intends to inform all parties affected - designers and enterprises as well as politicians, legislators and not least consumers - by the means of public relations, counsel, world-wide exhibitions, lectures - and now in the museum - about the extent, damages and dangers incurred by fakes and plagiarisms. There will be workshops and seminars on how to fight brand and product piracy in the conference room of the museum on a regular basis. In 1977 the Aktion Plagiarius awards were initiated by Prof. Rido Busse. Such a negative award “Plagiarius” serves to inform the public about the problem of fakes and plagiarisms and the negative impacts they have on not only the economy as a whole, but also on small companies and designers. They award the Aktion Plagiarius at the annual “Ambiente” trade fair during a press conference.